If you’re short on budget or just want to put your extra milk jugs to use, why not build a milk jug bird feeder? It is effortless and works very well attracting birds to your backyard. All you need is a milk jug, of course, and few other materials that usually you have in your house. In the process, you get to have fun crafting it and also recycle your unused milk bottles. Milk Jug, a gallon or half-gallon sized. Wash the inner part of the milk jug with soapy water, rinse properly and let it dry. The labels should come off pretty easily after washing. And if they don’t, you can cut them off or paint over them. 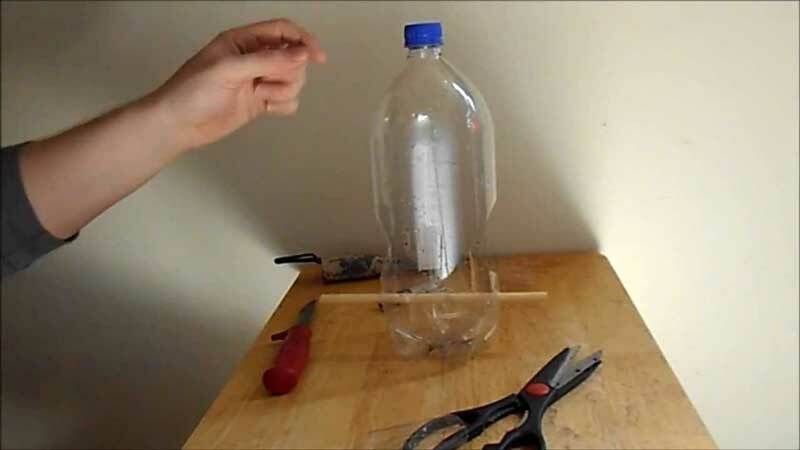 Draw a circular or any other shape on the bottle. You should position it in a way that allows birds to move about easily, so it should be in the middle and few inches from the jug’s bottom. Depending on bottles size, add more openings. Make sure the hole is about 3.5-4 inches in diameter, it will allow maximum birds. Use a scissor or any cutting tool to cut the opening according to your marking. If you drill a hole first and then cut with your scissors along the outline, it should be easier to do the job. Do a round cut. After cutting the circles off of the jug, puncture a small hole on two sides just below the large holes. It will allow the bird some extra perching available. The hole should be larger than the stick so that it can stay tight. Birds don’t like loose perches. Another option could be using a pie plate, the corners of it will work as perches. You just glue it in the bottom of the jug, and you won’t need any sticks or drilling. Before painting, you might want to add bottle caps or other things as decoration for your feeder. You can easily do that with glues. A problem is that you’ll have to wait at least one day to let the glue settle in. So if you don’t like waiting, thermowebzots could be the best option to add items to the feeder. You can also add stickers of insects to attract the birds easily. If you do, apply a fine layer of white glue on the stickers to help secure them. After a little time, the glue clears out. Paint the jug as you wish, try to make it look like something natural, like a small tree. Make sure the paint you’re using is free of toxicity. The paint will take some time to dry up. Finally, puncture a small hole in the jug cap and feed a string through. Make a tight knot and hang in a good, safe place. Fill the jug with bird seeds or your preferred bird feed. It might take several days for the birds to find this out, but when they do, they’ll be happy. So will you!